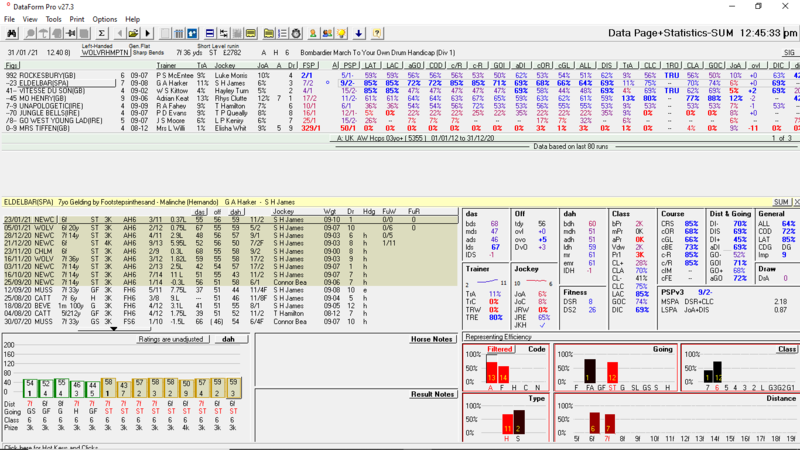 DataForm PRO | Horse Racing Data, Form, Ratings, Statistics, Analysis, Software. If you want to see the future take a look at the past! Developed since 1987, DataForm PRO is the ultimate form studio for UK and Irish horse racing. PRO's database, which includes all UK and Irish Flat, Jumps and All-Weather results with ratings and comments-in-running since 01/01/2001, resides on your PC's hard-disk so you can study form at high speed OFF-line. Navigate quickly from runner to runner and result to result. Click on any race, result, horse, trainer, jockey, or course to zoom in to detail. View the form, ratings, stats and live prices of all runners collectively and make easy visual comparisons. Find out what's important and when with PRO's unique Auto Data Pages. Create profitable systems with PRO's highly versatile Systems Analyser and make your racing pay. Get 5 high-striking consistently profitable systems for free with your first purchase (see Systems). Please use the menu above to learn more about PRO.